lovely presentation, with gear selection in the usual place, clutch operated by left foot and radiator rear mounted. That’s a new one on me. Have any of you any interesting, and different, pictures you would like to share? limited to a max of 20 persons for the full tour. You may like to attend but not go on the tour and just visit the museum. We start at The Norway Inn, Perranarworthal (A39 between Truro and Falmouth) at 10.00am to arrive at Davidstow for midday. If you would like to go could you please confirm because of the limited numbers on the full tour. John Harvey needs to let Steve at the museum know so he can arrange enough volunteers for us. Should be a great day of Cornish airfield history! John Harvey apollo25@hotmail.co.uk is the Natter leader. Andrew Vigor has sent in the following, covering a few issues that have arisen recently. There are no less than 10 different handbrake cables for the MGB, depending on the model and whether the car has wire or steel wheels. After replacing the rear brake cylinders I could not get the brakes adjusted correctly and resorted to taking the car in to my local garage. Later that day the mechanic showed me a rusty metal clamp that he had removed. It appears that the car had been fitted with the handbrake cable for a wire wheel car, which is too short for the steel wheel version. Rather than fit the correct cable it seems that a previous owner had bodged the job by making a clamp to extend the effective length of the cable. Fitting the correct cable has solved the problem. We have heard from a member recently with this problem. I urge you to check the bolt holding the latch is tight. If it gets loose, the key may turn the lock without releasing the latch. Disaster! The boot can be almost impossible to open and the boot lid may be damaged in the attempt. 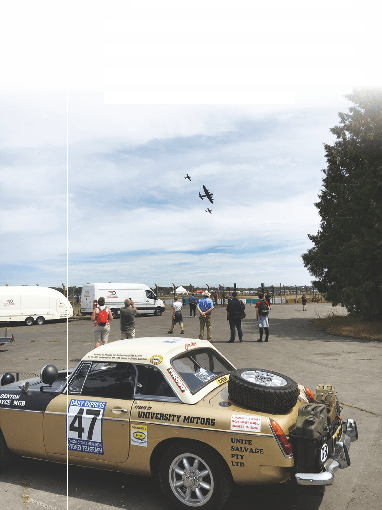 There is more information about this under ‘Tech Tips’ on the MGB Register website. There seem to be two options for the layout of the fuel pipes from the bulkhead to the carburettors. 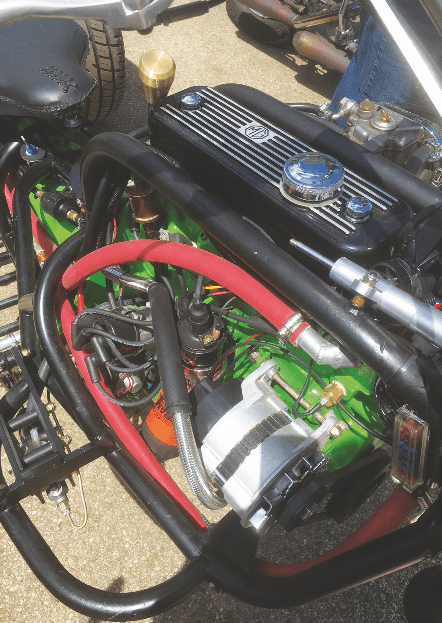 Either they go around the inner wing to the front carburettor then back to the rear one or directly to the rear carburettor then on to the front one. On replacing the fuel pipes in the engine bay – which were starting to look a bit tired – my garage changed the routing from the first option to the second. Since then, idling during hot weather in traffic queues has improved – presumably due to less fuel vaporisation. On routine checking I noticed that the spark plug in number four cylinder was almost white compared with the pale grey of the other three plugs. 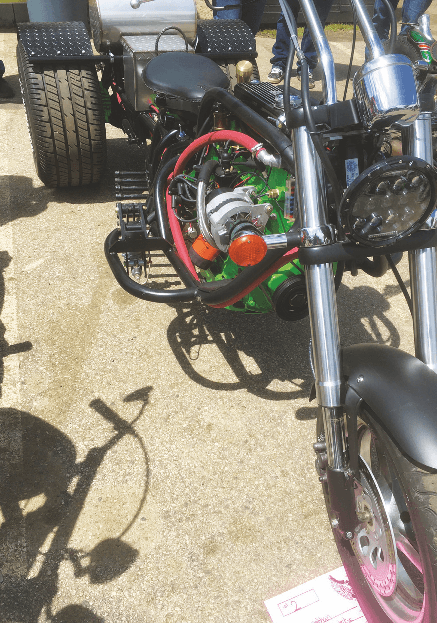 The pipe connected to the distributor had perished and cracked, letting air into the pipe and weakening the fuel mixture. This was easily fixed with a £2 replacement part, and possible rough running and engine damage were avoided. 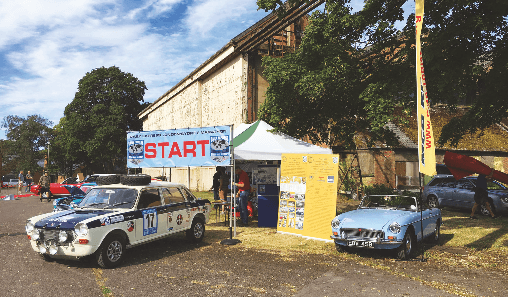 The MG Car Club Marathon MGB was invited to join a display by the Historic Marathon and World Cup Rally Car Group at the Bicester Heritage Classic & Sports Car Show. 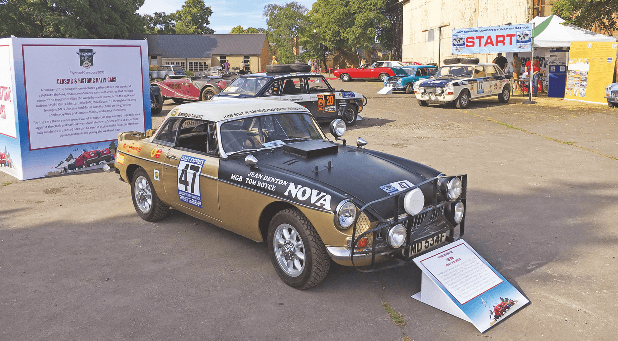 As well as the Jean Denton 1968 Marathon MGB there was a BMC1800 Landcrab that also entered the event, and also the BMC Maxi World Cup car that Jean Denton also drove. Thinking of the Jean Denton car and having had some correspondence with Mike Garton, I have been finding out something of the history of what we now refer to as the Marathon car. In this I am indebted to Mike Garton for access to notes that he kept from those early days of events with MGBs, and to Andy Knott for digging around in the Kimber House archives for contemporary material. I am editing this next piece from articles he penned for Safety Fast! in October and November 1968. In that year, Mike took an MGB GT for a long test drive. He considered that the MGB GT was best value for a medium-priced transport that offered the best of both worlds (ie family transport and something with sporting potential). Would it, though, provide room for two adults and children in comfort for a long journey? A combination holiday and trip to Florence for the Mugello race provided the opportunity. So, with Mike, his wife, Ian (5) and Janet (7) and all the usual luggage they set off from Abingdon to Southampton docks, thence to Le Havre. They had an overnight stop in a hotel by the port then onward to join the Autoroute du Sud near Orly. On the unrestricted road south the MGB maintained 4,500rpm in overdrive top sustaining 100mph for mile after mile and, though the weather was hot, the temperature stayed at 170 degrees Fahrenheit with oil pressure of 70psi. Mike drove through the day arriving at their holiday home at Vallauris at 11.00pm with 791 miles on the clock. Average speed had been 62 mph and no oil consumption. Fuel consumption averaged out at 23.5 mpg. Astonishingly, there had been no grumbles from the children who had curled up asleep for the last 100 miles. Mike says that he did not feel particularly traffic weary, though a cup of tea was welcome! So, having got the family settled in the south of France he drove into Italy for the Mugello race, close to Florence. The circuit is 66 kilometres (41.2 miles) long and in beautiful country. Woe betide you if you take time to admire it whilst attempting to drive round the track. 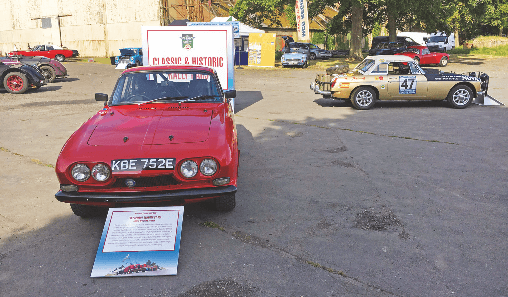 The photograph shows the race car that was to become famous by driving from London to Sydney and Mike’s BGT at the local garage they used for servicing the cars between practices and racing. The BGT also achieved many more laps of the race circuit than the actual race distance being driven by several people. It seems that it was worked so hard that it needed three pints of oil! The race itself is eight laps of the circuit and there were 91 starters. Tom Boyce had prepared the race car with a 4.13 diff which is a compromise with a mark II gearbox. Tom extracted nearly 130 bhp on 1 3/4’’ SUs and the rev counter had to be carefully watched. Oil pressure during the race held pretty constant at 70psi and the engine temp stayed around 170 Fahrenheit. The plan was that Mike would drive the first five laps and then swap with Jean Denton who would drive to the finish. The MGB started well down the list but Mike overhauled several early starters and he diced with a Porsche 911 (Peter Jackson) for two laps before he retired. On the straights he had to back off the throttle to 6,500rpm (around 120 mph) and the car was maintaining a 39-minute lap time. Having completed his five laps Mike came in to hand over to Jean, and having refuelled and topped up the oil Jean pushed the starter and…nothing. It had earthed itself internally and had to be replaced. (A push start would have meant disqualification). It was 35 minutes before Jean joined the fray. When Mike had pitted he had been third in class and in 22nd place on the road. Whilst swapping the starter motor a Porsche came through pushing them to fourth and another came through just after Jean left. Anxiously they all wondered if she could do it, but luck was not with them and she had to stop to change a plug lead, eventually taking the flag in fifth place by 38 seconds. UMD outside the garage in Scarleria with the owner, NBL 129E is a press car Mike borrowed to travel to Mugello and write a road test for October 1968 Safety Fast!